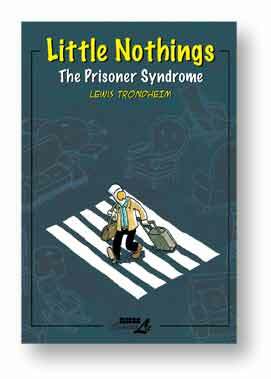 Okay, now it’s confirmed… the arrival of the second volume of Lewis Trondheim’s Little Nothings: The Prisoner Syndrome (NBM). I should really take that “Release not confirmed by Diamond” note seriously, shouldn’t I? Anyway, the first volume was a delight, leading me to strongly suspect that the second volume will be one too. Viz makes up for a couple of weeks of relative silence by crushing us all under the massive weight of its releases. Gin Tama Vol. 11, written and illustrated by Hideaki Sorachi: I really need to catch up with this series. It’s very funny. High School Debut Vol. 8, written and illustrated by Kazune Kawahara: I maintain that this is only the second-best adolescent romance series in the Shojo Beat line, but when the best is Sand Chronicles, there’s no shame in that. Honey and Clover Vol. 5, written and illustrated by Chica Umino: Even if there was a lot of competition among college-set romantic comedies, this one would still be the best. That doesn’t mean I wouldn’t like to see more comics vying for the title. Nana Vol. 15, written and illustrated by Ai Yazawa: From high school to college to early adulthood, Shojo Beat has your developmentally appropriate appetite for angst covered. Viz has a lot more to offer, including four volumes of Naruto, which should sew up the BookScan and USA Today rankings rather neatly for the month. Assuming you give any weight to those sorts of things, of course. Updated to correct an omission: In the comments, James Moar reminded me that my eyes scanned right past the first volume of Koji Kumeta’s Sayonara, Zetsubou-Sensei, due from Del Rey. This was dumb of me, because I’ve very much enjoyed what I’ve read of the book. It’s a very offbeat comedy about a suicidal teacher and his students, who are odd enough to drive sensitive persons to drastic measures, if they weren’t already so inclined. Give it a look. You are currently browsing the The Manga Curmudgeon blog archives for the day Tuesday, March 3rd, 2009.